JPiere is “Japan + iDempiere”. 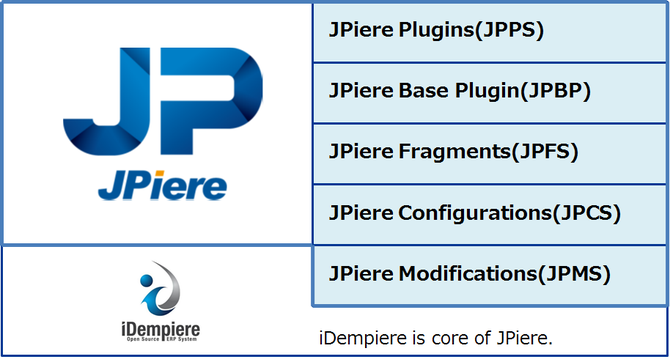 JPiere is Plugins of iDempiere and iDempiere Distribution for Japan. JPiere can update latest iDempiere. So, JPiere don’t need fork from iDempiere. JPiere is based on iDempiere and classifies it in five category as follows. JPiere Plugins(JPPS) is plugins that is not relation a Japanese business practice. JPPS is useful for not only Japanese, but also everyone. Everyone can select to install plugin. JPPS is independent from other JPiere plugins. JPiere Fragments(JPFS) is plugin that is fragment of OSGi. JPiere Configurations(JPCS) customizes iDempiere only by parameter setting. We need to set many parameters of iDempiere before use. So, JPCS optimize parameter setting beforehand. JPCS is not plugin. JPCS is Dump File of PostgreSQL. Please refer to Wiki for the details of the JPiere.